The Y Club is delighted to host Puddle Ducks Baby and Pre-school swimming classes in our lovely warm pool on Mondays, Fridays and Sunday mornings. 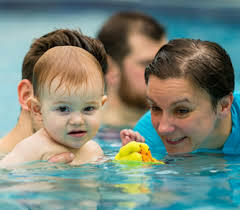 Swimming offers your baby a unique sensory experience and develops confidence in the water that lasts a lifetime, as well as truly magical one-to-one time for you and your new bundle of joy or pre-schooler. Puddle Ducks classes incorporate rhyme, music and movement based on extensive child development research. Puddle Ducks’ unique class songs are written by professional musicians. Their classes also teach invaluable water-safety and personal survival skills in our classes, which the children love practicing in their termly Pyjama Parties! Puddle Ducks has spent many years carefully developing their progressive lesson plans to develop swimmers, however their teachers adapt every activity to suit each child. Their baby-led swimming approach ensures that your child’s needs are expertly fulfilled – never forcing development, but rather nurturing it to ensure a positive experience and love of swimming. Puddle Ducks wonderful baby and pre-school programme is offered through five levels at Y Club – why not take a look at the Puddle Ducks video to see what’s in store? Floaties – welcoming babies from birth – babies love the freedom of movement and buoyancy that water offers. In these classes, important signals are introduced to create the basis for the coming levels. Parents also enjoy a magical bonding time. Kickers – from 15 months – toddlers love to splash, jump in, kick their legs and chase the toys, as well as interact with the other children in our fun games and activities. Most are extremely comfortable taking little swims on their own, both with woggles and unaided. Little Dippers – from 30 months – your child is beginning to enjoy the water with some new-found independence, often extremely proud of themselves as they realise they can do so much on their own: they can enter and exit the water safely and learning to swim short distances unaided. Dippers – focusing on coordination and propulsion… although they don’t know it and with bags of confidence, they have lots of fun! Balls, woggles and floats are used to improve alignment and style whilst confident jumping in makes an enormous splash! Your youngster will now initiate their own swimming and before long, their small swims get longer. Dippers classes are for children progressing from Little Dippers classes once they’ve achieved certain criteria. If you’d like to join a Puddle Ducks class please call 0161 883 0222 or email Manchester@puddleducks.com and if you’d like to find out more do have a look at the Puddle Ducks website at www.puddleducks.com/manchester. We look forward to welcoming you and your little one to a Puddle Ducks class at Y Club very soon!